Thomas Sio, Alaska’s lineman of the year for the 2018 high school football season, has parlayed his considerable size and talent into a Division I football scholarship. 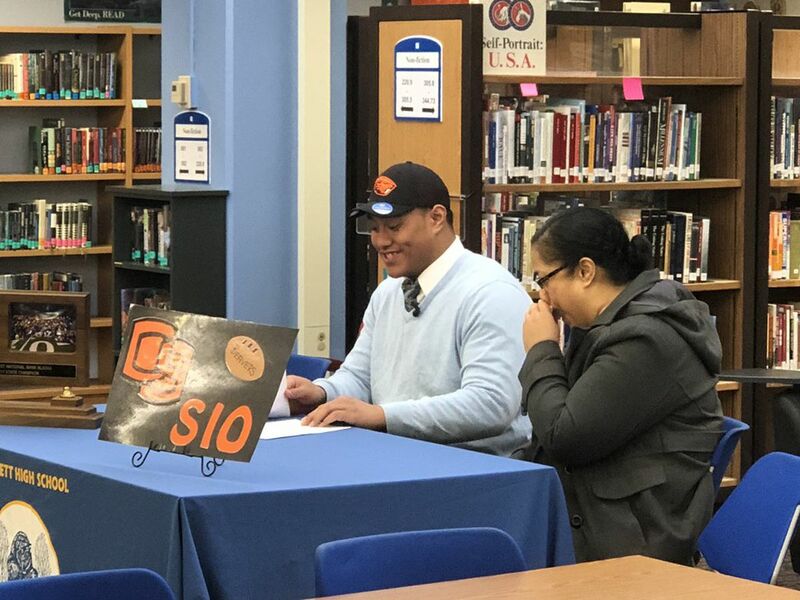 Sio, a 6-foot-4, 330-pound offensive lineman for the Bartlett Golden Bears, is headed to Oregon State in the fall. He signed his letter of intent Wednesday during a ceremony at the Bartlett library. Though Sio is the only Alaskan football prospect to accept a Division I offer this year, more than two dozen other players -- from Ketchikan to Barrow -- made commitments Wednesday. Here’s a list of Alaska’s latest crop of college-bound football players. Thomas Sio, Bartlett, Oregon State; Bolee Gridlee, West, Eastern New Mexico; Luke Guggenmoss, Palmer, Northwestern College (Iowa); Levi Brenner, Soldotna, Valley City State University; Cody Nye, Soldotna, Minnesota-Morris; Stevie Bryon, Ketchikan, Western State Colorado; David Cason, West, University of Dubuque; Corbin Tomaszewski, Lathrop, Colorado Mesa University; Eli Turvey, East, South Dakota School of Mines; Chase Brown, Lathrop, Lewis & Clark State College; Brandon Wieber, Ketchikan, Lewis & Clark State College; Tevita Tulimiua, West, Eastern New Mexico; Kordell Pillans, Kodiak, University of Montana (via Mesa Comunity College); Colton Herman, East, Bemedji State University; Aiden Williams, East, Minnesota Duluth; Elijah Lear, Bartlett, Presentation College (South Dakota); Kepa Wong, Ketchikan, Peru State College (Nebraska); Julian Baker, East, Bemedji State University; Ethan Connaker, Colony, Valley City State; Joseph Ruge, Wasilla, Valley City State; Joel Martinez, West, College of the Desert; Mekeehan Knittle, Palmer, Lewis & Clark State College; Jaden Littell, Lathrop, Baldwin Wallace; Jaun Mendez, Lathrop, Baldwin Wallace; Ben Heather, Barrow, Minnesota-Morris; Kobe Sherman, Eagle River, Lewis and Clark State College.